The First Fall issue of Knitty came out last week and I’m really excited about the project I have in it: The Jamestown Pullover is knit in one of our new for Fall 2015 yarns Artisan. 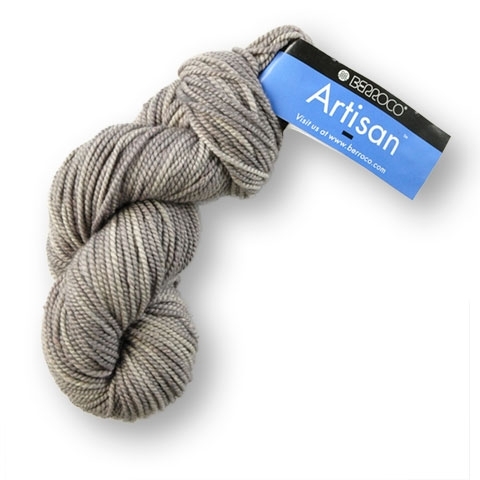 Artisan is a luxe blend of 80% merino wool and 20% mulberry silk. The silk is gently blended to leave a little bit of its noisy-tweedy texture then the yarn is spun into a nice round 2-ply worsted. The skeins are dip dyed and because the two fibers take the dye a little differently there is a lovely tonal variegation to the yarn. We love all of our yarns here at Berroco but this one is a new favorite. Jamestown is sized to a finished garment size 34.25[39, 43.5, 48.25, 51.25, 56, 59] inches- Its shown here worn with 5″ of positive ease. I knit mine in shade Deep Pacific #6038, you will need about 10 [11, 13, 15, 16, 18, 19] skeins. Read the pattern notes on the Knitty pattern page for further thoughts on choosing a size. I would love to see swatches of this yarn. Cool. Looks like a great sweater! What great sweater! And that yarn looks like it has some nice drape too. Into the queue it goes.